Simple, quick and easy - That's why we created our Theme Kitchen Linen Sets! 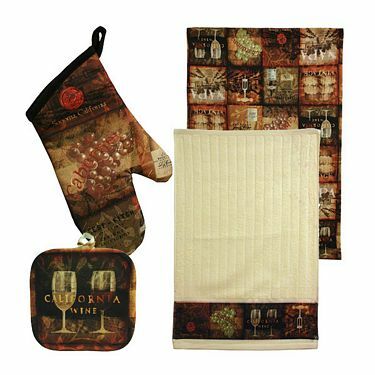 Add functional pieces to your kitchen without compromising your decorative theme with our 4 piece California Wine Kitchen Linen Set! Set includes two kitchen towels, one oven mitt and one pot holder. Essential pieces for any kitchen! Keep your wine theme fresh and complete! This kitchen linen set is wonderful, it's excellent quality and the colors are so vibrant. The towels were so soft I was tempted to keep the border towel to use in my bathroom as a facial towel. The full print kitchen towel was very smooth to the touch almost like silk. The pot holder and oven mitt were a bit stiff and starchy feeling, but I imagine they will loosen up after being washed. I plan on giving this set as a gift so I didn't want to wash it myself first. I would have kept the entire set for myself, but it doesn't go with the theme already in place in my kitchen. I will be watching the Theme Kitchen website though because they are always adding new items and lines to their collection. Win it: One lucky reader will win a $25 store credit to Theme Kitchen. This giveaway will end April 25th at 10 PM EST. The winner will have 48 hours to respond to my email. If no response, a new winner will be chosen. Open to residents of the US. Mandatory Entry: (Mandatory entry must be completed first or bonus entries don't count.) *Tell me what you'd like to purchase if you win the $25 credit? I'd get something from the Palm Tree collection. Punched Tin Collection is AWESOME!! I have a mix of country rooster and cow and this would be great!! I'd get the Big Apple Paper Towel and Napkin Holder for my mother. I would buy the Big Apple soap dispenser. I like theme decor stores on facebook. thank you for another great giveaway! if i win, i'll use the credit toward items in the Provencal Rooster collection! I'd get the Country Cats Placemat. I need new pot holders!! I'd get the seashells by the seashore coffee mugs. I like Theme decor store on Facebook as Ricky Todd. I would get something from the Sunflower collection. I like the country rooster collection. I love the palm tree collection! I would like to give this to my mom and let her choose! She lost her home and it is in the process of being replaced and this would help her out! Thanks for the opportunity! I'd get the Striped Lighthouse spoon rest. Would love to get the Red Pottery Utensil Holder with the GC. It would look awesome in my kitchen. The Country Cats Oil Cruet is really cute! I'd buy the rooster pitcher and utensil holder. I'd purchase the Folk Hearts & Stars Utensil Holder. I follow Theme Decor Stores on Facebook (FB name: Maddie Brubaker). I would get the Bistro Candy Dish. I would get the Sunflower Sponge Holder. I would like to buy several items from their Provencal Rooster collection, such as the oven mitt and dish towel. I like the palm tree collection! My kitchen has no theme so I would love to get this! Possibly the Country Cats Oil Cruet. I'd get a soap dispensor. I love the flora and fauna table runner or anything else from that collection ! I need new oven mitts. Flora and Fauna Plates Set of 4.
i LOVE their red clay pots! I think I would get the Bistro wine cooler. Definitely something from the Bistro collection. Crossing my fingers. I would get the 'Folk Hearts & Stars Utensil Holder' found here: http://www.themekitchen.com/folkheartsandstarsutensilholder.aspx. Thanks for the giveaway.